Since I began making these custom made Topps cards that never were, I have intentionally avoided one player. Not out of desire to create his cards, but more of hesitancy that what I created would only be passable or adequate. In my eye, the Splendid Splinter needed custom cards worthy of his accomplishments. 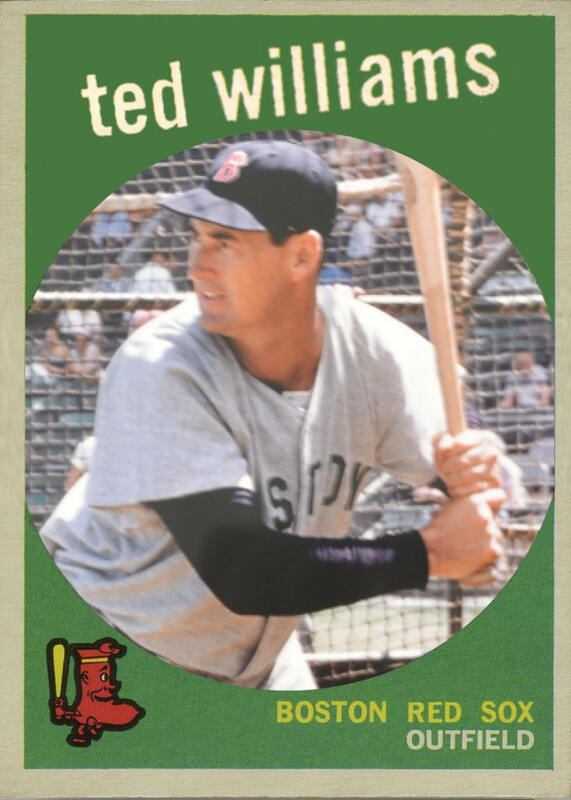 So, after 25+ creations and a lot of trepidation on my part, I’m willing to share my version of Ted Williams’ 1959 Topps card. Why the apprehension in creating a Ted Williams card? While I do consider Teddy Ballgame the greatest hitter ever (even better than Tony Gwynn, gasp! ), I have a more important reason. Ted Williams is my Dad’s favorite baseball player. Ever. That’s a big deal to me, especially compounded with the fact that Tony Gwynn is my favorite player, and that he and Ted Williams struck up a friendship late in Mr. Williams’ life. Between those two players, my Dad and I have carved out a huge chunk of baseball history and lore to claim as our own. That in itself deserves my respect. As for the 1959 Topps card, it is not the final Topps card that should have been for Ted Williams. In fact, I have two more coming on the heels of this one, his 1960 and 1961 Topps releases. From what I can gather, it seems that Ted Williams signed an exclusive contract with Fleer to produce the Ted Williams Sets from 1959 through 1961. This would seem to be the reason for no Ted Williams’ Topps cards in 1959, 1960 and 1961. Someone please correct me if I am mistaken. Of the three Williams’ in the cue, I consider this the least “worthy.” I worked for hours on this card trying to get every last pixel right. The template ended up looking great, but the photo doesn’t quite go with the era. The picture is too clear and I can’t recall many swinging photos in the 1959 set. could you do another version of 1959 Topps Ted Williams (preferably a head shot)? He is also my favorite player! Thanks.